This week, F&W’s Test Kitchen welcomed spring with a baby lettuce salad combining tender young leaves like romaine, arugula, mizuna and escarole—each of which offered a unique texture and flavor. What made this dish especially interesting? This week, F&W’s Test Kitchen welcomed spring with a baby lettuce salad combining tender young leaves like romaine, arugula, mizuna and escarole—each of which offered a unique texture and flavor. What made this dish especially interesting was the surprising addition of sweet strawberries, tangy feta and addictive smoked almonds. 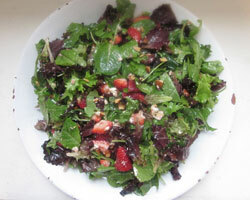 It all came together with a simple and light vinaigrette of Dijon mustard and red wine vinegar. This recipe will be published in our June issue, but in the meantime, try this equally outstanding Spring Lettuce Salad with Roasted Asparagus.